Since becoming a do-it-yourself-er, I’ve been asked several questions about my motivations and how-tos of this approach to life. 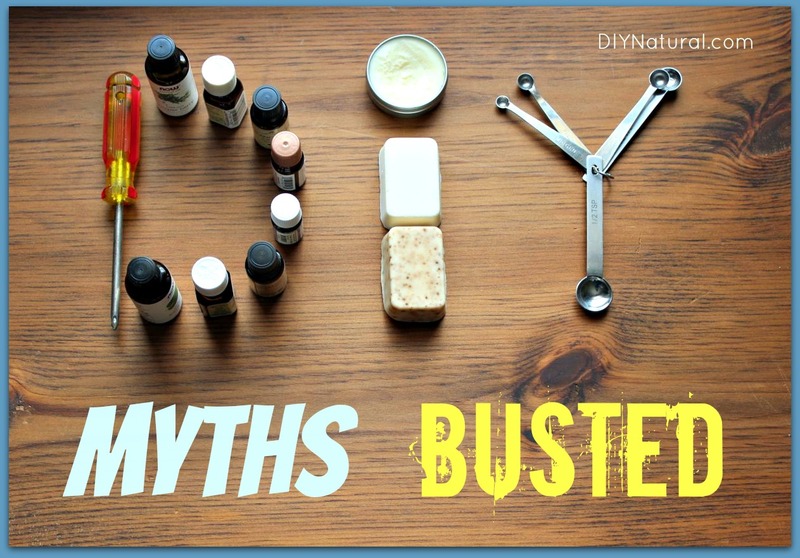 I’ve also encountered several myths about the DIY lifestyle. For instance, over the years, I’ve become a bit more radical than most as I tread this path. Others assume they need to do the exact same thing in order to adopt a DIY approach. Not true! One of my favorite aspects of the DIY lifestyle is the community of like-minded people you can surround yourself with. Facebook is one of my favorite tools for finding others who might want to team up on projects with me or give me ideas when I’m stuck. Even if you can’t find someone locally to help you with projects, you can find online communities that love to support fellow DIYers. Take the DIY Natural community for example. People are always posting their questions and other members are quick to offer wisdom and support. There’s no reason to go it alone. Some people are under the impression that you have to be a hippie (or close to it) to do DIY projects. Not true! When I entered the DIY lifestyle, it was to save money. Then, it became a way to improve my health. Now, after increasing my knowledge about natural living, I love it and have become quite crunchy. But you don’t have to be crunchy to DIY. You just need to have the desire to find a better/cheaper/less toxic way of doing what you’re already doing. While I’m all for investing in the DIY lifestyle, I’m also a minimalist and I make a point to not buy a bunch of equipment. I have limited space for anything other than multi-purpose tools and I like not having everything. Why? Because it gives me the opportunity to interact with others who do. My husband is remodeling a school bus into an RV. He’s a paramedic, not a contractor. Which means he’s been learning as he goes. Between the internet, friends and family and his amazing ability to figure this stuff out, he’s getting the work done. Was he hesitant to take on this project? Yes. But he also knows from past experience that you don’t need to be an expert to DIY. You just need to know where to find the information you need. But what about all of the money it takes to do these DIY projects? Supplies, equipment – it all adds up, right? Not necessarily. As I mentioned earlier, you can always borrow equipment, or try to find it used. You can also create a monthly DIY budget that you can use toward buying supplies for your next project or a multi-purpose tool you know you’ll use often. You can also start small. For the cost of one box of natural laundry detergent, I can make enough to last me three months. That one simple task already frees up money to buy supplies for other projects. Oh, and here are five simple ways to make DIY more affordable. Conversely, some people think you need to be broke to do things yourself. Why bother if you can afford to buy whatever you need? Many reasons, actually. For one, just because you have a lot of extra money to spend, doesn’t mean you have to. It could be used to pay off debt, or saved up for something fun, or given to a cause of your choice. Doing things yourself also allows you to avoid using harmful products. There’s also a great deal of satisfaction in completing your own projects. Even mundane tasks, like doing laundry, are more enjoyable now because I know that my detergent smells awesome because I combined the scents myself. But if you think that by making your own laundry detergent you’re now obligated to make everything else by yourself, rest assured that you don’t have to. Know of any other DIY myths that need busting? Share them below! I guess the only thing I would add is that it is empowering to know that you can make things and make your family more self-sufficient. This country was once all about self-sufficiency. But as we have grown, we have become more and more dependent on others to fill our needs – which can easily make people feel like the world is out of control. A sense of empowerment, even over little things like getting your clothes clean without having to purchase some product that you have no control over, can make a difference in the fear with which you view the world. Since no one knows the future, it is good to have this knowledge. When I first made my laundry detergent, my husband and step-son said why make something you can buy? I said because I can and because I don’t know that we will always be able to buy these things. Think of when the grocery store is out of something – instead of getting concerned and wondering how we will get the product, I feel like I can say Oh well, I’ll bet I could make it anyway. The person receiving the credit is essential to spend it back with interest costs on the date of his next paycheck. DIY – with joy! That’s the key – not drudgery. Giving ourselves permission to celebrate DIY and not see it as a burden. I just had some fun making my own kombucha and it was such a fun project – still relishing the joy of drinking my very own DIY kombucha! We definitely like it’s simple, clean black styling, push-button central dial and nicely labeled front controls, and the way that stations have sounded as we. Raima has options to limit individual file sizes in the preferences dialog. I totally agree with you. Luckly I wouldn’t “need” to go DIY since we are economically fine, but if I can save some money for extras… great! Plus I get rid of lots of “unknown” ingredients that are usually not healthy. In addition to that, the satisfaction of doing something from scratch and by myself is totally worth it. I’m starting to make things myself and testing the results and I’m completely satisfied. Also the fact that I don’t need to check the discounts and run to the store when I’m missing something is great!! For the record, I make 10 liters of my liquid laundry for 1,20€ when it would cost me around 15€ in a store (with good discounts like 3×2 or second unit at 70% off, sorry for the €, I’m writting from Spain :O)). There are lots of things I still need to try and I’m so excited about it!! Thank you for sharing with us!! I love these tips! I have been reading through your eBook and LOVE all the recipes, I am almost using completely natural products to clean and your recipes work so well (and I actually feel like everything is clean). Thanks for such a great blog and book! I hear the complaint that it takes too much time–it’s so much easier to buy the laundry detergent than to make it. The money savings is a big reason I make homemade products. I happen to enjoy sewing and quilting so that savings can be put to use at my local fabric store:-) I have also become increasingly aware of all the poisons that are part of “safe” products for our home and for our bodies. (If I think about it too much, it just makes me mad!) It is also fun for me to try new recipes. I wish I had discovered all this when my kids were little, but now I can teach them and protect my grandchildren from some of the bad stuff out there. Thanks for your encouraging and informative articles! I love learning new things! Thanks! I have to remind myself of that all the time, Jan!